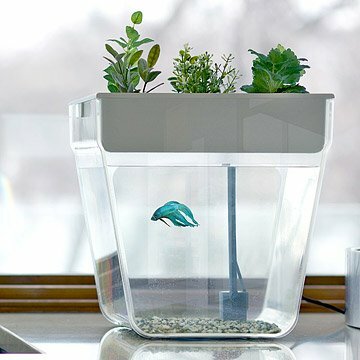 This herb garden and self-cleaning fish tank combo makes growing edible greens easy and fun. There are certain essentials you need for gardening success: seeds, sunlight, water, betta fish. That last one may be unexpected, but it is the key ingredient to this revolutionary countertop garden. The double-decker combination of garden and fish bowl creates a symbiotic ecosystem. In the top tray, basil, mint, spinach, baby greens, and other edible or decorative plants thrive as nutrient-rich water is circulated past their roots. That process purifies the water, which is then sent back to the 3-gallon tank below, creating a happy, healthy habitat for a betta fish. The Water Garden makes an intriguing visual centerpiece for your own environment, whether that's on a side table or countertop, in an office, classroom or kitchen. Made in Union City, California. Click here for Water Garden Instructions. For the newest model, check out our Water Garden Deluxe. The Water Garden comes with everything needed to get started including organic seeds, a chemical free dechlorinator, and a sampling packet of fish food. Instructions were a little vague but we quickly figured out what to do to get it set up. Tank was cloudy for a few days until the plants sprouted and then it cleared right up. We added a couple of plastic plants and our fish seems really happy in there. Great purchase. Very attractive! It was ok for about a week or two but then the whole thing had to come apart to clean. It was exhausting and time consuming because there are lots of pieces. Unfortunately, I think this product still needs work and should not be sold at this point. My pump continuously made a terrible noise after only having for one month. I made sure to check the amount of water in tank, moved the pump around, moved the tubes around. Nothing worked. The white lid did not properly fit on my fish tank. I found myself having to clean this fish tank as much as any other. After not even two months I had to throw this tank out. A waste of money. On the bright side, the concept is great, the look is great, and the sprouts grow! I was just hoping for a little more. I love the size of this aquarium. We bought this as a gift for my brother's family. They have a 3 year old and the family enjoys cooking. We thought the 3 year old would enjoy the fish and parents could have a low maintenance garden to grow herbs in. I keep one moderately large sized goldfish in here and he loves it! When I first started planting some of the seeds fell into his water but they didn't seem to bother him and he may have even eaten some without any harmful effect. The design is clean and easy to assemble. The plants are hardy and grow very quickly! Aquarium is a perfect size and comes with everything you need to get started. Plants sprouted quickly and I have significant growth in less than a week. It does take a bit to get it set up as you can't remove the top without disturbing the pump cords which is a bit inconvenient, but not a deal breaker. Definitely visit the website for videos on set up, as written instructions are not comprehensive. It turned out lovely though, and I have one happy betta! Nice gift for a busy college student. Purchased this as a gift for college age student to use in a dorm. All of the pieces seems to be present and the instructions were clear and easy to follow. My sprouts are already producing. We'er off to a great start with our aqua farm!